LynTec, a manufacturer of customized electrical power control for professional audio, video, and lighting systems, today said that the company's RPCR remotely controlled relay panel was named as one of Sound & Video Contractor's (SVC) 2013 Most Innovative Products. Suitable for houses of worship, schools, performing arts centers, auditoriums, and other large assembly spaces, LynTec's RPCR is the only relay panel built specifically for the entertainment industry. "We are extremely proud to add the RPCR to our roster of award-winning RPC products," said Mark Bishop, president of LynTec. 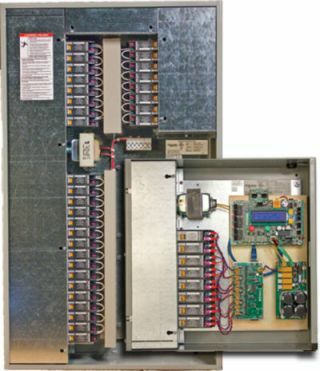 "Designed to easily support the retrofit circuit control requirements of any existing electrical panel, we've added innovative features, such as the ability to interface with today's most popular control systems, and an integrated Web server built directly into the controller. The result is total flexibility coupled with anywhere, anytime access to the relay panel from any browser-enabled device." RPCR panels add on/off control to any existing circuit breaker panel installation and are compatible with popular control systems, such as ETC, Creston, and AMX. In addition, the units offer the ability to control relays directly via TCP/IP, DMX, RS-232, or contact closure control systems. Featuring brownout protection, the RPCR will automatically shut down selected circuits during under-voltage situations and power-up as programmed when voltage regains stability. The units also provide emergency power-on for egress lighting and shutdown capabilities for amplifiers with contact closure inputs from fire alarms. Thanks to the RPCR's built-in Web server and browser-based interface, users can set up, troubleshoot, control, and monitor relay status remotely across existing networks from any computer, tablet, or handheld smart device. In addition, users can receive alert notifications via text or email to warn of voltage anomalies.